Uncover that grill of yours. It’s time to grill up some steaks and eat outside! 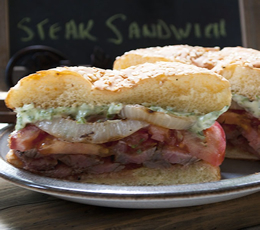 This sandwich recipe comes from our newest Featured Foodie, The Kitchen Witch. Welcome! We love you already! To prepare steak, combine first 7 ingredients in a large zip-top plastic bag. Add steak, seal and marinate in refrigerator for 2 hours, turning bag occasionally. remove steak from bag, reserving marinade. Pour marinade into a microwave safe bowl, microwave at High 2 minutes or until mixture comes to a boil. Set aside. To prepare dressing, combine arugula, mayonnaise and salt (if desired). Place steak on a grill or broiler pan coated with cooking spray. Grill or broil 8 minutes each side or until steak is medium rare or desired degree of doneness. remove steak from grill or broiler, cover and let stand 5 minutes. Place onion slices on grill rack, grill 4 minutes on each side basting occasionally. Alternatively you can broil the onions of pan fry them. Place rolls on grill rack, cut side down, grill 2 minutes minutes or broil until lightly browned. Cut steak diagonally across grain into thin slices. Spread 2 tablespoons dressing on bottom half of each roll. Divide steak, tomato and onion evenly among bottom halves of rolls. Top with top halves or rolls. Vialia onions taste better eaten raw and spanish or yellow onions taste better when cooked. Try making onion soup with vadalia onions and you’ll see what I mean. Of course you can do what ever you want they’re your taste buds.